It’s that time of year again, deep in the dark of winter, when Christmas is almost upon us; and we sit a fair distance away from the next riveting season of HBO’s Game of Thrones, and even longer from the next book in the Song of Ice and Fire series by George R. R. Martin. You’re probably thinking in these dark times what possible gift could I be rewarded with that will make everything feel better, what pricey item would make the perfect Christmas present or possibly a worthwhile spending of the Christmas money? 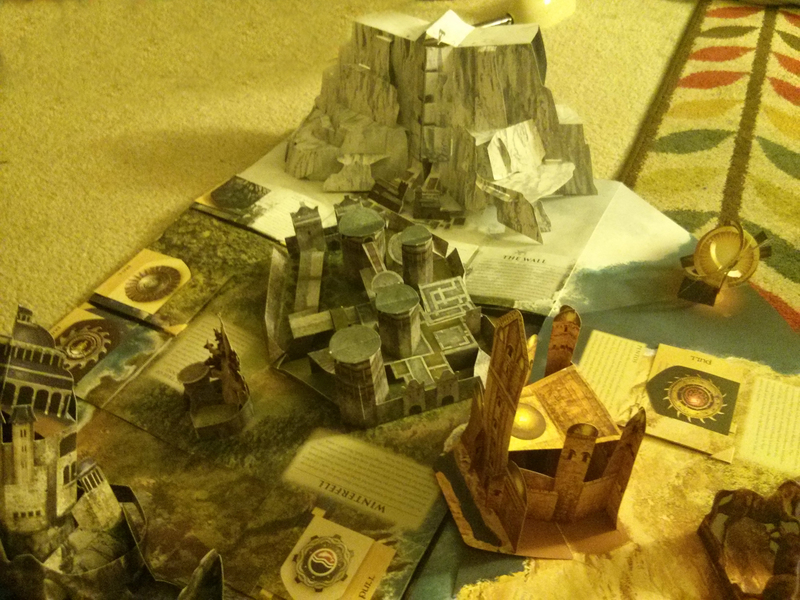 Why not take a look at Game of Thrones: A Pop-Up Guide to Westeros. There aren’t many books out there to which nothing bad can be said about them, and this is one of those very rare books. 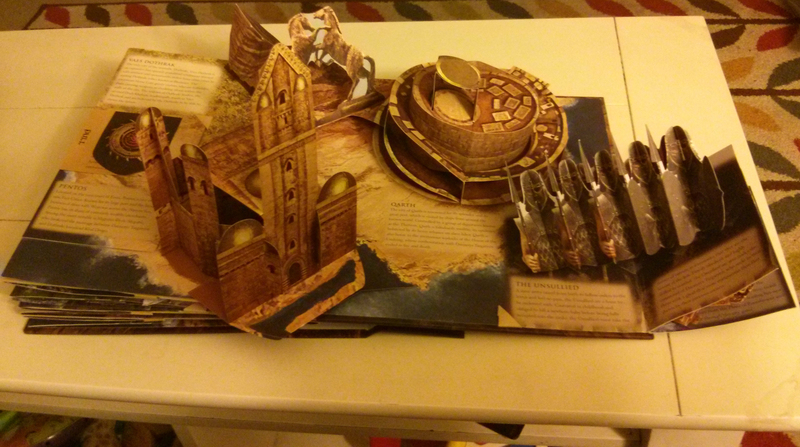 However, there is a dilemma with this beautiful pop-up book, which is that you want to continuously open it and lift every flap and card and pop-up section and study and read and admire; but at the same time you also want to keep everything pristine and mint and unopened to preserve its value and perfection. 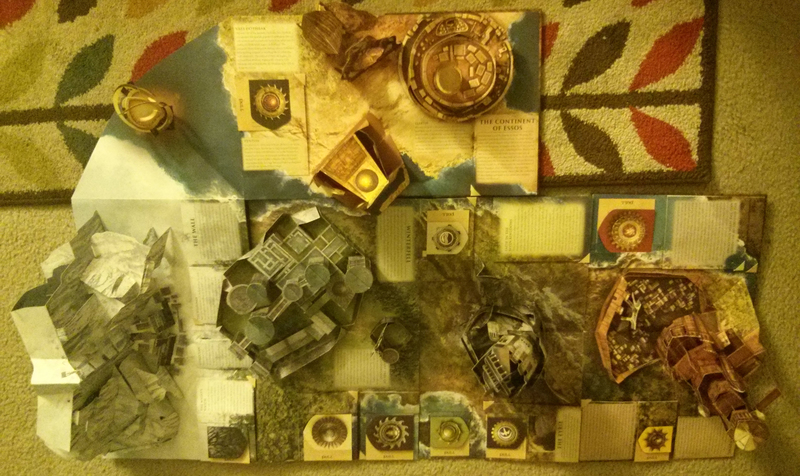 Much as with anything Matthew Reinhart puts his mind and skill to, this is simply an astonishing work of art. One of his more recent popular works of genius is Star Wars: A Pop-up Guide to the Galaxy. 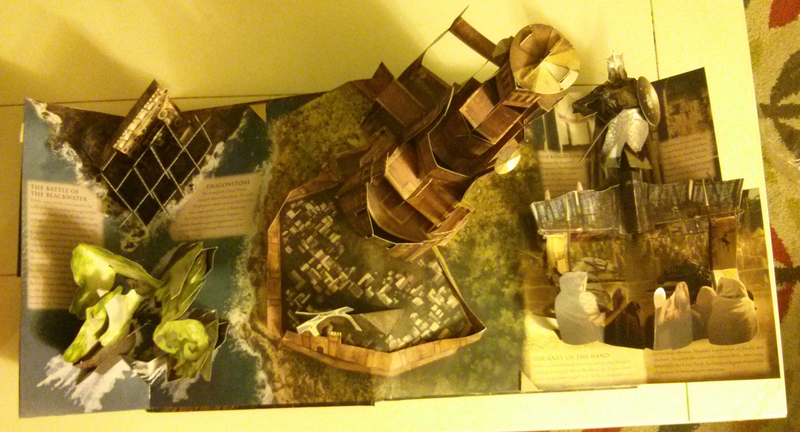 The level of detail and work that has gone into this pop-up book knows no bounds. 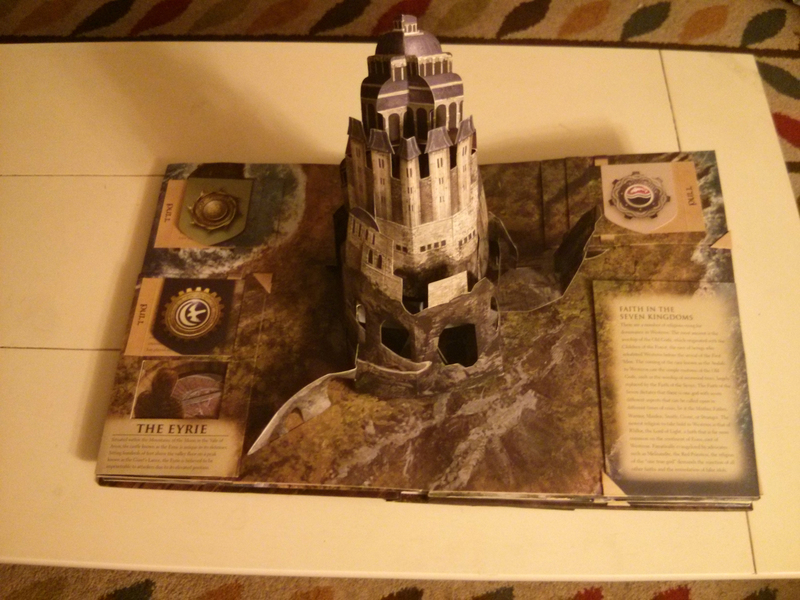 Generally, your average pop-up book will have maybe one or two on a page, and sometimes none to continue whatever story it is trying to tell, not so with Game of Thrones. Reinhart pushes the envelope with multiple levels of pop-ups cunningly conceived and designed to defy artistic logic, while other great page-spanning scenes rise up from the paper like Lazarus to dazzle your very eyes. In addition to the main pop-up on each page, the smaller sub-pop-up has a little corner cover to be folded into so that it remains firmly locked in place and protected, making it easy to release and open up and admire, and then put back again in safety. This device also makes it easy to know how to open up a pop-up so it doesn’t bend the wrong way and possibly get damaged. 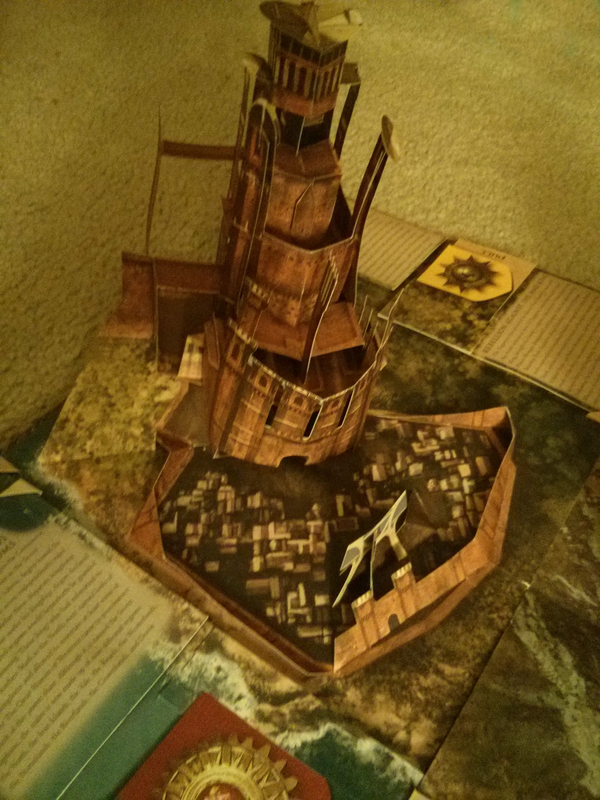 The book takes you across the scenes and locations of Westeros, showing you the lands and its citadels, giving you information on the people and characters and some of the familiar story pieces you have come to love and hate and perhaps love again. 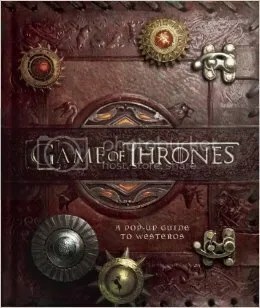 Whether you’re an addict of the books, the TV show or both, as you slowly and delicately leaf through this incredible book you will no doubt have the Game of Thrones theme song running in your head. Originally written on November 23, 2014 ©Alex C. Telander. 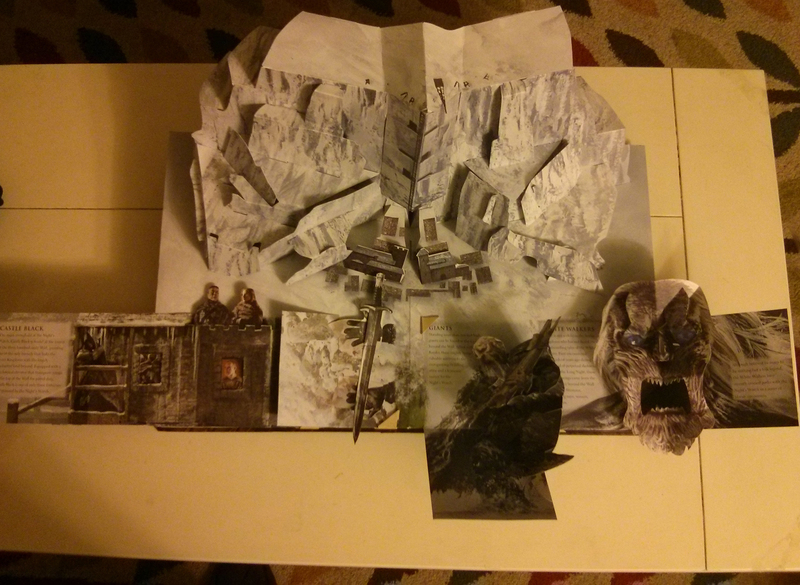 To purchase a copy of Game of Thrones: A Pop-Up Guide to Westeros from Bookshop Santa Cruz, and help support BookBanter, click HERE. 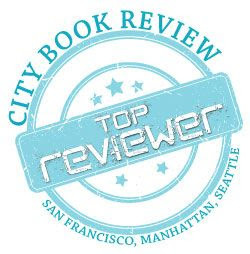 ← Book News: National Book Award Winners Announced, King’s THE STAND Becomes a Quadrilogy, Colbert Takes on Amazon & More! Looks like a great Christmas present . . . for me!